One of the greatest turkey days of the year – Christmas – is just around the corner, but you don’t need to wait until the holidays to enjoy the goodness that turkey brings. As much as I look forward to a festive feast featuring a whole roast turkey and all the fixings, I don’t wait for those few days a year to cook with turkey. In fact, I have turkey on my table on weekly basis. Why do I choose to cook with turkey all year long? Turkey is nutritious. Turkey is protein plus so much more. It’s lean, nutrient-rich and packed with vitamins like brain-boosting vitamin B12 and minerals like zinc and selenium for a healthy immune system. Turkey is delicious. Turkey is moist and full of flavour making it ideal for simple weekday meals. It also pairs perfectly with all sorts of seasonings from all around the world. Curry? Yes! Ginger? Sure! Coconut? Yep! Turkey is versatile. From thighs and wings to breasts and steaks, there are so many turkey cuts and so many tasty ways to enjoy them. I seriously love getting creative in the kitchen and swapping turkey into classic recipes like lasagna, burgers, fajitas, curries and casseroles. 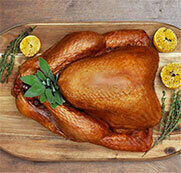 Need some inspiration for how to cook with turkey any day? Here are three ways that turkey makes any day better! That’s right, turkey for breakfast! Mornings are something to look forward to when you’ve got these simple, wholesome make-ahead Grab And Go Turkey Muffins. They’re filled with eggs, turkey and lots of veggies to keep you energized all morning. Keep them in the fridge so you can just heat and eat – no fork required. Double Up! Make extra turkey thighs when you’re cooking dinner and use the leftovers to make a couple trays of these muffins. They freeze perfectly. Keeping lunch light yet satisfying is one of the keys to staving off the 2:00pm afternoon energy slump. Turkey is lean yet packed with protein so it’s an ideal light lunch choice, especially in this oh-so-good Healthy Turkey Bowl with Cashew Lemon Dressing. Meal prep for the win! Roast a turkey breast on the weekend so you have fresh roasted turkey for sandwiches and salads for a packed lunch that won’t weigh you down. Cook once and eat three times with these baked Big Batch Meatballs. 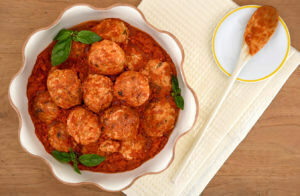 Double or triple the recipe and freeze in meal-size portions so you’ll have meatballs at the ready for meals through the month. No repeats! I switch up how I serve these meatballs: in saucy submarine sandwiches, simmered in this Classic Italian Tomato Sauce and served with salad or in this tasty Tuscan Turkey Meatball Soup. Next time you’re at the grocery store or butcher, ask about available cuts, let your inner chef fly and try turkey in your favourite recipes.